I wanted to pass these photos along to you so you could see what some of the middle school students did last week for the holidays out here in Pine Valley. I wanted to do some kind of community service type project with my students during this holiday time and after Becky Sharp and I started brainstorming we decided to make baby blankets with the kids to donate to a local organization in San Diego. The organization is called Gently Hugged and they create baskets during the holidays to be given to families of military service men and women, low income families, and single parent homes. The baskets often include clothes, toys, food donations, and baby blankets. We were able to get most of the fabric we used donated by Becky Sharp’s sister and the rest was purchased from Hobby Lobby, where they gave me a discount as a teacher. 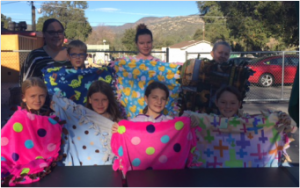 The kids did an amazing job with this project and they had a great time working in pairs on their blankets. 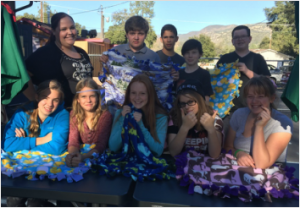 All 3 grades, 6th-8th, made blankets and we were able to make 30 blankets to be donated. I will be taking the blankets in tomorrow to be donated. Hope you enjoy the pictures. Have a great day! So, as I was on Facebook I saw a virtual run for Butterfly Children, so I clicked on it. It happens that “Butterfly Children” are kids with a very painful, genetic disease where their skin is as thin as a butterfly. After watching the video, I shared it with my class. You can sign up to run a “race” anywhere, pay your fee, upload your results, and get a medal. For this race, half the fee goes to the “Butterfly Children” and the medal is a butterfly! Today 3 students and myself did 3.1 miles and will be receiving our medals shortly. One of my students did it on her Home Study day and will also receive a medal. We have also sent the information to the rest of our site. This “race” is until October 31st, but every month they have a race for a charity. I plan on doing one once a month and encouraging our students also to participate. We are running to spread good! “I just read Jennifer’s letter, and I wanted to share with you what happen on our way home from school on Thursday. My son and I stopped for a special treat for making it through the first week. On our way out a couple whom didn’t speak much English stopped us and asked us for directions. 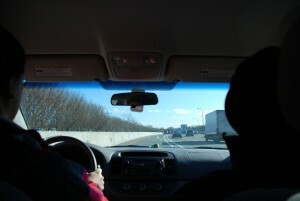 They didn’t really understand what I was telling them, or the map I drew for them, so I suggested that I drive to where they needed to go and they could follow me in their own car. They agreed that would work. On our drive my son just kept saying “Well, wouldn’t you know we are doing it.” I said, “Doing what?” “You know the Butterfly effect, you do a nice thing for someone and it helps them out and makes a change for the better.” I said “Yes, that is what we are supposed to do, help other people out if we can.” I didn’t think anything about it. In fact, I might have been a little annoyed that he was making such a big deal about being kind and helpful. 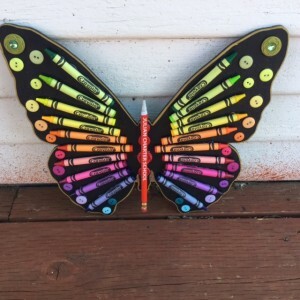 Monday, August 24, 2015 – JCS Butterfly Drop #2 took place on the first day of school. Because it was so busy, we didn’t even get it posted to our social media sites, but that didn’t stop Cameron Byrd from netting the butterfly on the new Temecula facility! He’s asked that the $250 be donated to “Sharing the Table” part of his church’s mission to serve students food over the weekend who would otherwise go hungry! We’re making the change one butterfly at a time! 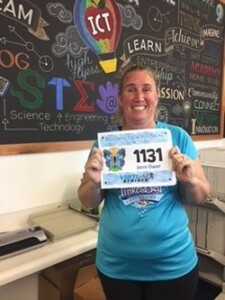 Monday, August 3rd, Julian Charter School made the first move towards “teaching the change we want to see in the world.” A butterfly was dropped at 11:15 a.m. and by 11:30, Ms. Betsy Balcao found the butterfly on the campus of the JCS PLC program. 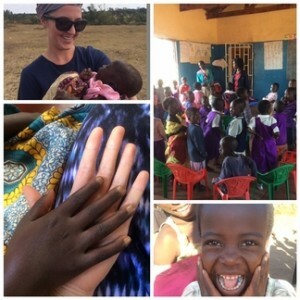 Betsy decided to donate the $250 to Children of the Nations, a charity where she supports a little girl and had the opportunity to travel to Malawi, Africa this summer to meet this little girl who hopes to grow up and become a teacher some day. Ms. Balcao spent a few days meeting and bonding with the children of the Chirombo village. Betsy shared that the $250 donation to this charity would almost sponsor a child, for all of his/her needs, for a year. Thanks to the generosity of the JCS staff, and the “Butterfly Effect”, JCS raised enough to fully fund two students through Children of the Nations for a year! Then, as an added bonus, when we went online to make the donation, Children of the Nations would double our donation, thus helping FOUR children! Don’t let the ripple effect stop here; continue flapping your wings and making a difference in the world. YOUR LIFE MATTERS! Be the change you want to see….